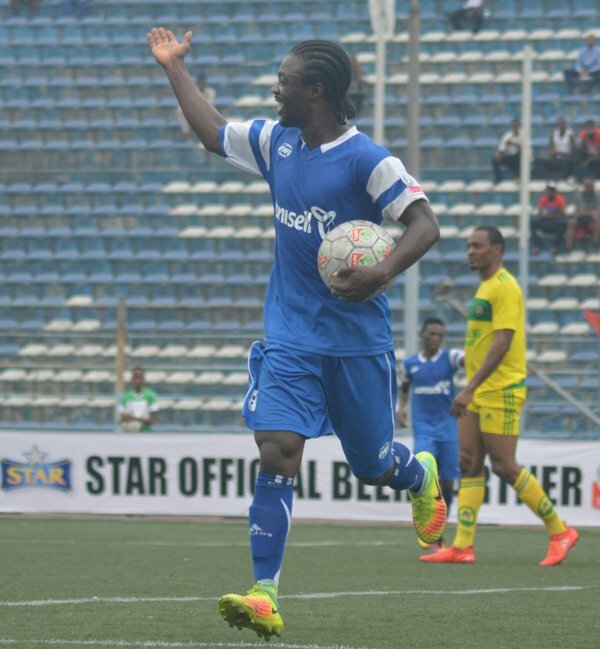 Guy Kuemian celebrating a goal in the domestic Nigeria Professional Football League (NPFL). Nigeria’s remaining campaigner in the continent, Rivers United continues the quest to make an impact in the group stage of the 2017 CAF Confederation Cup, this afternoon, in Port-Harcourt. 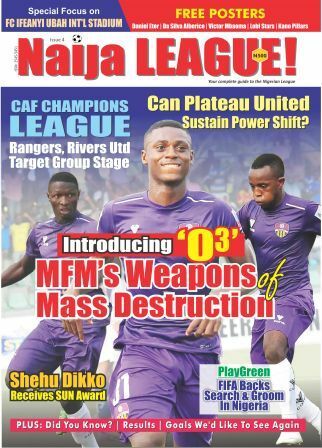 In this report, naijapleaguez.com.ng Editor, OJEIKERE GLOVER AIKHOJE, examines the way forward as the competition enters its second round. Nigerian side, Rivers United is in a must-win situation as the club seeks to revive hopes of reaching the knock-out stages of the 2017 Caf Confederation Cup. Placed bottom of the four-team group, Rivers United begin the reverse round of the Group with a home match against Kampala City Council Authority (KCCA). The last meeting ended 2-1 in favor of the Ugandans with a brace from Derrick Nsibambi, while Bolaji Sarkin scored for the Nigerians. To make an impact in the competition, Rivers United’s attack must deliver. Goals are crucial at this stage and Rivers United gaffer, Stanley Eguma, must find a way to overcome this challenge. Domestically, the problem of scoring goals remains unanswered. Rivers have the poorest attack in the group with only three goals, while group leaders, FUS Rabat and third placed Club Africain, have five goals each. KCCA have scored four goals. Interestingly, all three goals were scored in three matches with John Odemegwu, Emeka Atuloma and Bolaji Sarkin providing the goals. Although, Rivers have scored in two away matches, the club failed to win on both occasions. The only victory at home came from Atuloma’s strike against FUS Rabat. Indeed, the attack has been inconsistent as Emeka Ogbugh, who started on the opening day at Club Africain, has since disappeared from match day starting XI due to his performance, in Tunis. Ivorian import, Guy Kuemian and Bernard Ovoke are yet to make any impact so far. Eguma’s rotational policy must stop to ensure consistency in front of goal. For Rivers United to move out of the bottom of the log, Eguma’s attack must deliver this afternoon at the Yakubu Gowon Stadium, Port-Harcourt.